Effective September 29, 2016, the PayPal Student Debit MasterCard, and all related services, will be closed. This means that following this date, you or your student will be unable to use your PayPal Student Debit MasterCard. Additionally, as of this date, PayPal Student Accounts will no longer be able to be used to make purchases online or in stores. You or your student will still be able to transfer funds to your designated bank account, or to send money to either the associated parent’s PayPal account, or to another recipient, following this date. Effective November 15, 2016, all student Accounts will be closed, and any remaining funds in them will be transferred to the associated parent’s PayPal account. That means parents with kids under 18 are out of luck completely. And those with kids 18 and over will no longer enjoy a centralized place to manage accounts, transfer funds, and view transactions across the family. Please stop telling us to open a bank account. My son has a bank account and a debit card. The debit card has a $10 limit on it. In general, debit cards are an extremely bad way of paying for anything. The Paypal card had the advantage of only authorizing what was in the student account. It is great for teenagers. They can text when they need money. You can set alerts. A good example is putting $20 on it for them to go with their friends to a restaurant. As soon as he pays, I get a text that his account is low. But, I also know he will be home soon or I will need to go pick him up. For our college student, he has a bank account, he has his Paypal and an AMEX card from our account plus the school card. The AMEX is for school cost and an emergency. The Paypal is for everything else that he is not using his bank account for. The Paypal [Student Account] was great product while it lasted. It helped me teach a lot about finance including account structuring. A delay option is not good for teenagers. We used Paypal for our sons when they have gone on school trips. Long gone are the days of travelers checks. Only authorize what’s in the student account. Kids can only spend the funds that you’ve explicitly moved onto their cards. If they try to spend more, the transaction will simply be declined. There are no overdraft fees when that happens. Ever. Text when they need money. Kids can make money requests within the FamZoo app(lication). They fill in a form indicating the amount and purpose. You get a text message. Tap on the embedded link to approve, partially approve, or deny the request. Any approved funds move instantly from your parent card to your kid’s card. Parents can also schedule regular money movements by setting up automated allowance or chore payments. Get a text when they spend money. Both parents and kids can get text alerts whenever there is activity on a FamZoo card. The text always includes the remaining balance. That may not sound like a big deal, but our families have found instant balance feedback to be an amazingly effective and simple way to keep teen spending in check. Instantaneous transfers. All transfers between FamZoo cards within a family are immediate. There is however a very key difference here between FamZoo’s solution and how PayPal Student accounts worked. Unlike PayPal, FamZoo never pulls money from your bank account. FamZoo doesn’t even know your bank account info. Instead, you periodically push a pool of money onto your parent funding card. From there it can be distributed to the kids instantly and in arbitrarily small amounts. You can see all the different ways to load money onto your parent funding card here. College student discretionary spending. 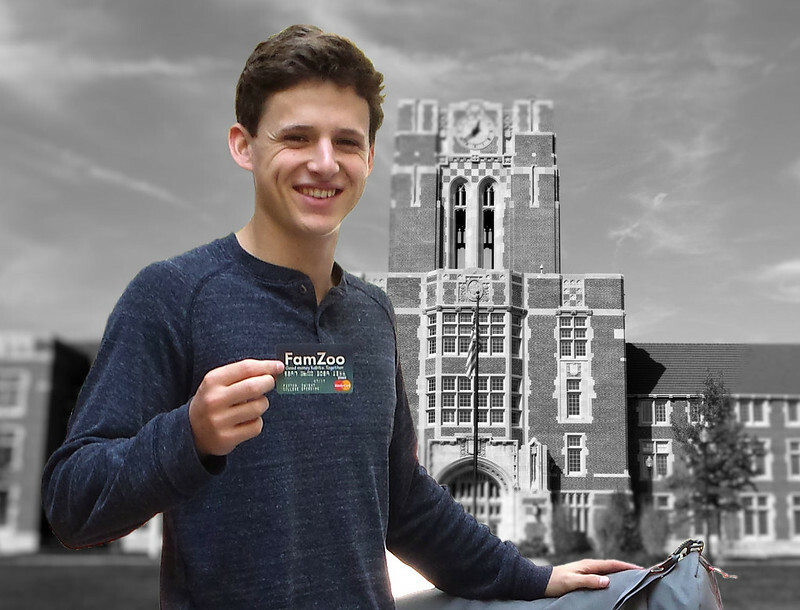 FamZoo cards are perfect for handling discretionary spending in college without having to worry about overdraft fees or mounting credit card debt. The money requests and automated reimbursements are particularly popular features during the college years. (“Dad, can you shoot me money for a text book? I’m in line right now!’ “Mom, will you reimburse this payment for toilet paper?”) Activity alerts are big too. In fact, sometimes that’s the only way I know my three kids in college are still alive! Learn about personal finance. This is where FamZoo cards really stand apart from other offerings. The system was built specifically with education in mind. FamZoo can be used to teach your kids about the power of compound interest, the responsibility of regular bills, the hard work it takes to earn a buck, splitting income between spend/save/give, the painful cost of debt (without using a credit card), and much more. See these related educational features: parent-paid interest, family expense sharing, integrated chore and odd-job charts, income splits, parent-managed loans. We’ve been repeatedly recognized over the years for setting the bar in this area and will continue to raise it. So if you’re looking for an alternative to PayPal Student Accounts that delivers even more in the financial education department, welcome to FamZoo. I'm using Famzoo as an alternative to PayPal - but there are a couple of differences if you are comparing this to the PayPal Student account. To transfer money into Famzoo takes 3 business days via Pop money from my bank account. I've not found a faster way to do this - other than to leave a large amount sitting in the Famzoo account ready to transfer to your son/daughter. So, I'd really like to see them come up with a faster way to transfer the money without being charged - it is not identical by any means to the way the PayPal Student card worked. Sorry.. I was really hoping that it would be a great alternative, but the PayPal Student card worked tremendously well, with no charges. Famzoo has charges (for the account), plus it takes too long to send money into the account. Hi there. Thank you for checking out FamZoo with your family and taking the time to leave your frank feedback. You are correct: most load methods do take a few days to get money to your primary funding card. The exceptions are Greendot's MoneyPak and Reload @ the Register which are within minutes but they require visiting a retail store and incur a larger fee. And, yes, the recommended practice is to keep a stash of funds on your primary funding card so you can make immediate and arbitrarily small distributions to the kids at no charge. That's because once we have money in our card processor's system, we can move it between a family's cards instantly without fees. It is definitely a key difference from the now defunct PayPal Student Accounts, and I explicitly emphasize it in the "Instantaneous transfers" section as well as in our FAQs for load methods. We too wish we could provide an instant, free, online loading mechanism. That would be awesome! Unfortunately, we'd have to get licensed in every state as a money transmitter to do so. That costs millions of dollars. As a money transfer service, we'd also become a magnet for fraud (perhaps that's why PayPal cancelled their service - we can only speculate though, since as far as I know they have not revealed why they shut Student Accounts down). Perhaps someday we will become large enough to offer such a capability. Or, perhaps when same day ACH transfers roll out from banks this will become less of an issue (https://www.nacha.org/rules/same-day-ach-moving-payments-faster). It's definitely ridiculous that bank-to-bank transfers take so absurdly long in today's world. Frustration shared. In any case, all of this misses a major point made in the final bullet above entitled "Learn about personal finance." That's really what FamZoo cards and software are all about - delivering an effective, hands-on financial education to kids. You'll find our capabilities are unparalleled in that regard. And when you compare our program's costs to what we pay to teach our kids skills in other areas (piano lessons, sports equipment/programs, tutors, books, etc), it's really just a micro drop in the bucket. I hope that doesn't come off as too defensive. Your comment highlights important differences, and we definitely do not want families to be surprised or disappointed.